Business RSS News: What is UX Design and How Can it Help Your Small Business? What is UX Design and How Can it Help Your Small Business? User Experience (UX) Design is the term used to describe the process of enhancing user satisfaction by creating products that provide relevant and meaningful experiences. By improving the accessibility and usability of a product, the satisfaction of interacting with the product is enhanced. Whether it’s a website, software or any product for an end-user, the objective of UX Design is to generate an enjoyable, seamless experience for the user. How Can UX Design Help a Small Business? Such frictionless, satisfying experiences are important for small businesses, as they help boost customer satisfaction by providing enhanced accessibility, usability and enjoyable interaction with a product. The increased customer satisfaction generated through UX design means small businesses help attract and retain customers, sell a greater number of products and remain more competitive and profitable. Users expectations on their experience of products are on the rise. Consequently, to remain competitive, businesses need to implement UX design into their products to ensure their customers have the seamless, pleasurable experience they have come to expect. UX is an important component of website design, with users expecting an easy-to-navigate, seamless and pleasurable journey as they browse through a site, whether on a PC, laptop or mobile phone. A poor UX on websites, such as delays to loading times, can quickly result in a potential customer navigating away from the site. Neil Patel, co-founder of Neil Patel Digital, and leading influencer in digital marketing, notes the importance of website loading times in the user experience., with something as short as a one second delay in page response, resulting in a 16% decease in customer satisfaction. “Page loading time is obviously an important part of any website’s user experience. And many times, we’ll let it slide to accommodate better aesthetic design, new nifty functionality or to add more content to web pages. Unfortunately, website visitors tend to care more about speed than all the bells and whistles we want to add to our websites,” says Patel in his blog. Frooition, specialists in professional eBay designs for ecommerce sites, is familiar with UX designs in websites. 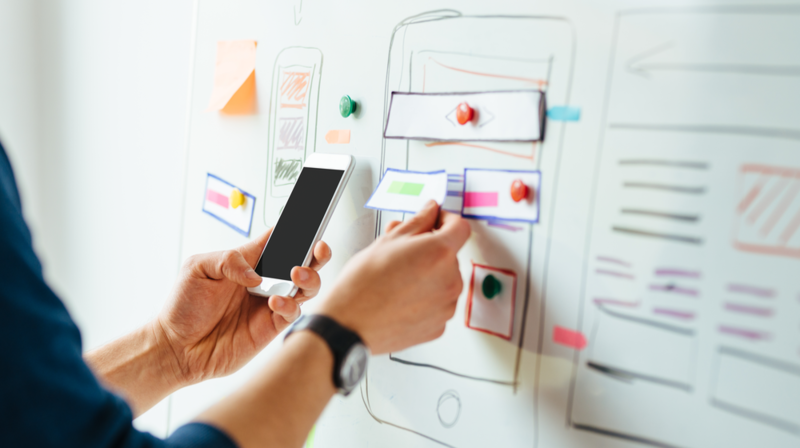 Andrew Pinner, Business Development Manager at Frooition, told Small Business Trends how the company tends to use UX designs behind the scenes for its clients and stick to the best UX for the majority of clients, only slightly changes the UX on a client by client basis. “The UX is the combination of the frame and placement of a website as well as the process of reporting and learning from the reporting you get. It is like the chassis and engine of a car combined with the speedometer. Without the speedo how do you know you are travelling faster with Engine A vs engine B,” Andrew Pinner told Small Business Trends. “UX is critical for small businesses, without the correct fundamentals of UX an e-commerce site will not perform optimally. “There are a number of things that users expect to see, without these features the sites feel alien and create a bad or frustrating experience. Over the last 5 years we have seen the tolerance for bad UX continue to drop, buyers expect a good experience and make buying decisions in seconds, if it takes minutes to find your navigation then you won’t succeed. “There are businesses that succeed by breaking convention, but it is a fine line, think of Snapchat, when it was first launched the UX of swiping was novel, new and created an inclusion for its users that were in the know. More recently they altered the layout and brought stories into a different place – this backfired as users hated it. “UX is like a service or utility, you don’t notice it until it’s not there or wrong, users shouldn’t notice good UX, but they will very quickly notice bad UX,” Frootion’s Business Development Manager added. Ceros Originals, providers of interaction content creation software, reiterates the need for UX design. “User experience is a part of the design process that you don’t hear about unless something goes wrong. But it is something that should be an integral part of the design process from early concepts to the final product,” Ceros Originals advises. If you’re small business is yet to consider UX design in its products, it’s not to late to start building products with the user experience in mind, to ensure your customer remember your brand and products for the right reasons.